This 0.5 acre site was a former gas station located within the flood plain of the Assabet River. Situated in close proximity to a large residential development, numerous neighborhood meetings were held, the outcome of which ultimately enabled the project to move forward. Lighting and sound studies were performed and following months of hearings, approvals were obtained from the town’s Natural Resource Commission, zoning and planning board(s). The project remains in a residential zone. 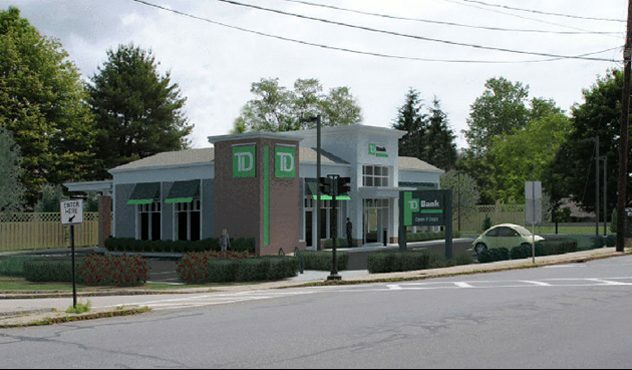 However, due to the change of use, it was determined that the TD Bank was less detrimental than the existing gas station use and the redevelopment was allowed to proceed. Through engineering and architectural enhancements, a LEED certification of “Gold” was achieved.